Make sure to watch the tutorial video below! I created this recipe to celebrate National Peanut Butter Month with 10 other vegan bloggers! 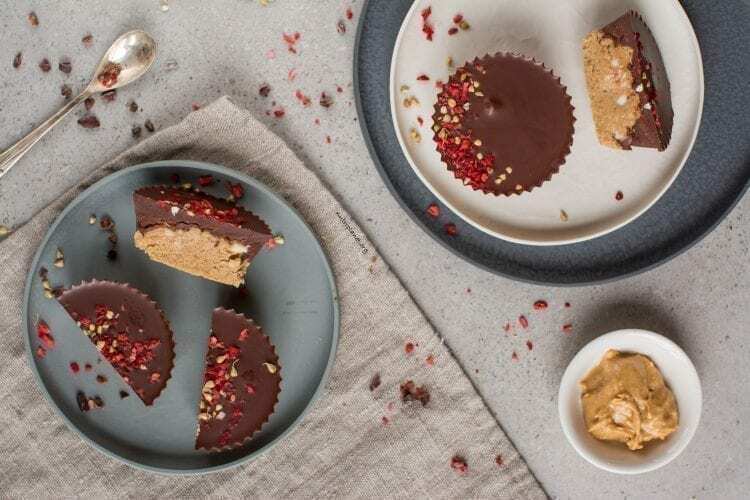 In other words – we teamed up and created 11 Easy Sweet and Savoury Vegan Peanut Butter Recipes. Be sure to check them all out! 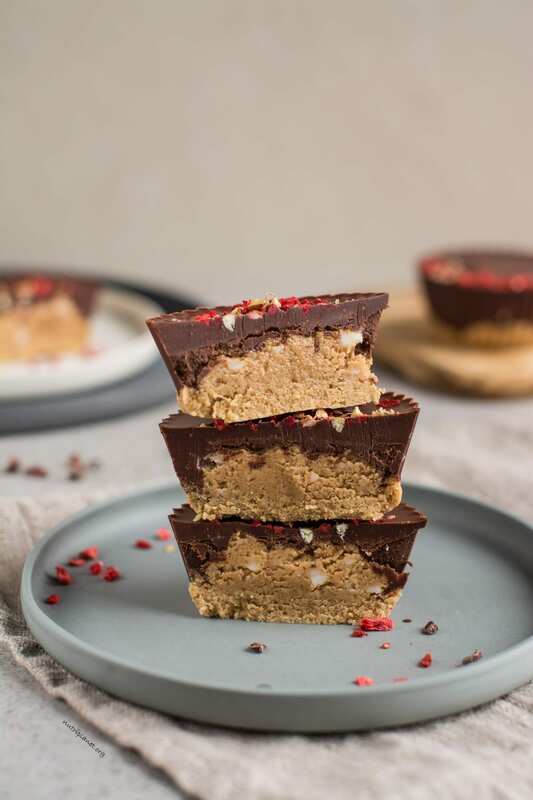 Besides my peanut butter cup recipe you’ll find Muffins, Overnight Oats, Fudge, Crunch Bars, Chocolate Pie, Sweet Potato Stew, Brownies, Hummus, Granola, Thai Noodle Soup. My homemade peanut butter cups are both simple and delicious, but the recipe wasn’t born easy at all. In fact, I don’t remember struggling with any creation as much. All my versions where delicious, but there was just something not right – either the base was too moist or too dry or the caramel layer not sweet enough etc. Can you imagine how many peanut butter cups I ate during the process? 🙂 In fact, I gained 1 kg of weight over the process! Hence the moral – don’t have 2-4 cups every day for a week! 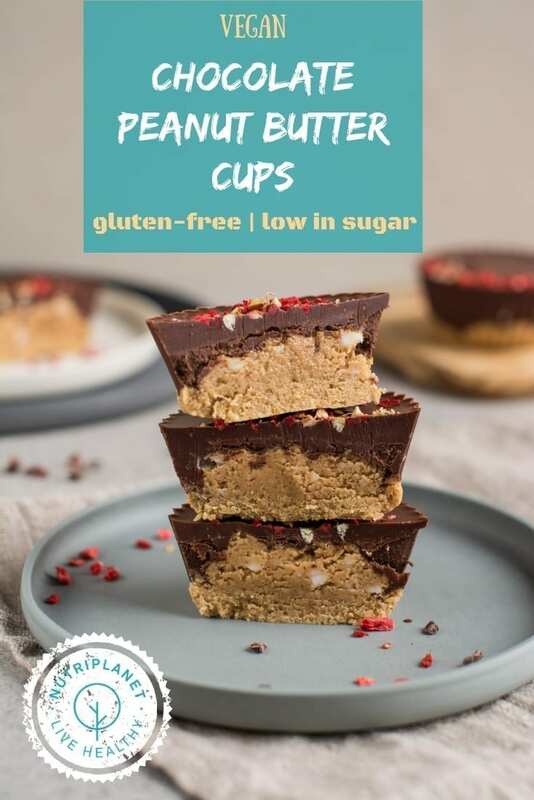 Then, one day I baked my Chickpea Cookie Dough Bites (just craved something lighter) and it was my hubby who said that it would make a perfect base for my peanut butter cup recipe. Thank you dear! 🙂 And indeed, the next day showed that he was absolutely right – I was finally at peace with my vegan peanut butter cups. The new base turned out to be moist and crumbly enough. I even dare to say that I’ve created healthy peanut butter cups (well, healthier at least), because the new base layer brought the fats down significantly. Should you want them heavier, feel free to use my Shortcrust Pastry recipe for base layer instead. What’s so great about my sugar free peanut butter cups? Perfect mid-morning or afternoon snack to pick you up. Only 9 ingredients (not counting salt and sweetener). So perfectly salted caramel peanut butter bites! 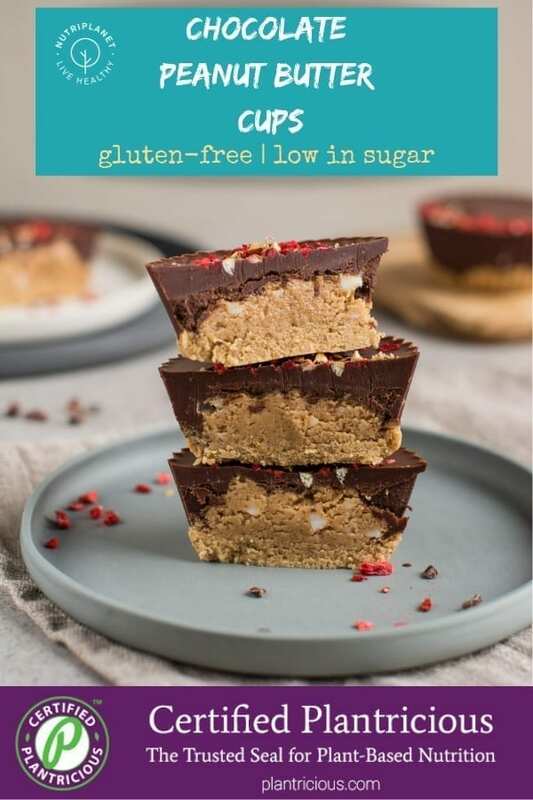 Now, given that I worked so hard on those peanut butter cups, I’d be extra grateful to receive your feedback or questions below in comments’ section! I’d be also thrilled to see your shares on social media! First, have all your nut butters at room temperature. Once you have prepared the cookie dough, take muffin tin and fill the holes with cupcake liners or silicone muffin moulds. Divide the base batter evenly between 6 cups and press it down with your fingers. Bake them at 180°C (355°F) for 20 minutes. Then, in a small bowl mix together the peanut butter layer ingredients. Use a small spoon or spatula for mixing. Again, divide it evenly between the cups placing it onto the base layer. Don’t spread it until the edges though to let the melted chocolate do its magic later. For the chocolate layer, chop your cocoa liquor or dark chocolate, measure coconut puree and peanut butter and place them into a heatproof bowl. Next, bring water to simmer in your saucepan. Then, turn off the heat. Now, set the heatproof bowl in the mouth of the pot, making sure the bowl doesn’t touch the bottom of the saucepan. Stir coconut puree, chocolate and peanut butter mass as it softens. Make sure not to let even a drop of water to come in contact with your cocoa mass. You can also use a double boiler or a water bath melt dish, if you have one. Once you have a nice runny mass, remove the bowl from heat and whisk in salt and sweetener. Pour the melted chocolate on top of your peanut butter cups. Refrigerate for about 1.5-2 hours until your chocolate peanut butter cups are firm. Optional: garnish with chopped nuts and seeds, dehydrated berries, and/or dehydrated buckwheat sprouts. Nutritional info per cup: 258 kcal, 11g carbohydrates (31% of kcal), 17.9g fats (62.3% of kcal), 9.67g protein (15% of kcal), 7.27g fibre, 107mg sodium, and 4.2 GL points. Nutritional info per cup (with date sugar): 282 kcal, 16.5g carbohydrates (36.1% of kcal), 18g fats (57.5% of kcal), 9.84g protein (13.9% of kcal), 7.25g fibre, and 107mg sodium. You may also make no bake version of the base layer – to make it crumblier, mix about a tablespoon of extra coconut or almond flour into the dough. You might need to use your hands. Those cups are not overly sweet. So, you can always add more (or less) of sweetener – depends on your palate. I like the peanut butter mixture sweeter than the base layer – just find the contrasts fit perfectly together. Any reduced fat nut flour can be used instead of almond flour, i.e. coconut flour, hazelnut flour or peanut flour. Feel free to sub some of the peanut butter with any other nut butter in the caramel layer. I like to use half peanut butter and half almond butter. Light tahini also works well in this recipe. If you prefer your peanut butter filling really soft and runny, ditch the almond flour in the caramel base recipe. It’d be quite difficult to substitute mesquite flour, as this is the ingredient that gives the caramel taste. However, if you’re not struggling with Candida overgrowth, use coconut sugar instead of stevia for its caramel flavour. To make up the absence of mesquite, add an extra ½ tablespoon of almond flour though. You can use dark chocolate instead of cocoa liquor. Remember that you’ll need less of sweetener if your chocolate is already sweetened. Feel free to use xylitol instead of liquid stevia also in the chocolate layer. However, grind it into powdered sugar, otherwise it won’t dissolve. If you want your peanut butter cups extra chocolaty, mix some dark chocolate chips into the caramel layer. Allergic to peanut butter? 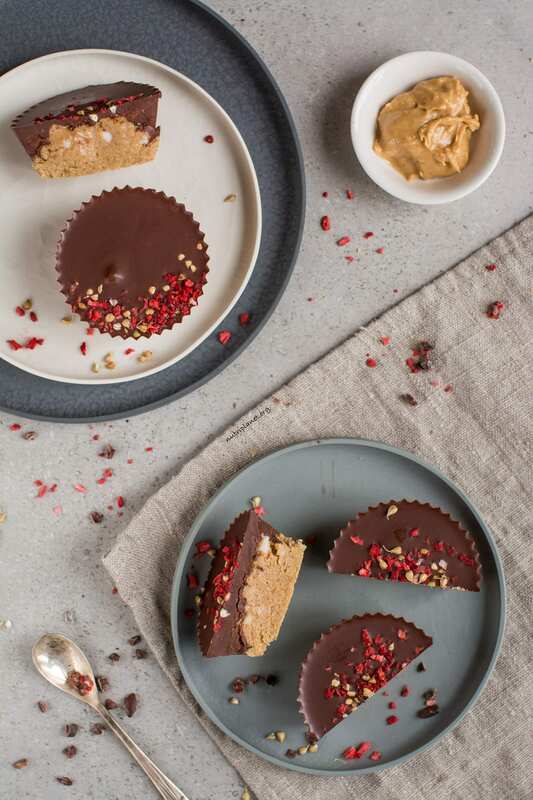 Make almond butter cups instead! Those cups can even be made totally nut-free, by using tahini and sunflower butter. You’d probably need to add more of sweetener though.